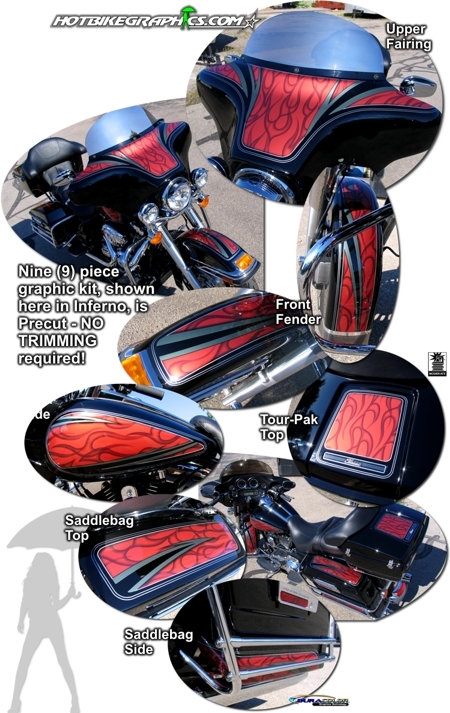 Set your bike apart from the rest with this hot-looking nine (9) piece Airbrush Flame Graphics kit! Available in one (1) of three unique Kandy color combinations (Inferno, SuperFly or Dark [Neutral]), pieces feature metallic silver and charcoal elements as shown. While graphics are designed and shown on a 2013 Harley-Davidson Electra Glide Classic, the precut graphic kit is uniquely designed to fit a range of Harley-Davidson's Touring line and, perhaps with slight trimming, will look great on just about any bike. Digitally printed with our DuraCOLOR graphic technology, kit is manufactured with premium automotive grade vinyl film materials. Vinyl product is manufactured with an advanced air release system, a grey-pigmented solvent-based repositionable adhesive and cast construction for highly conformable performance of the most difficult curves and irregular surfaces. As a further step, graphic is covered with a 2 mil clear laminate (Gloss or Matte) which provides protection from miles of abuse. As noted above, kit is manufactured with an advanced air release system. Thus, a "wet" installation method is not recommended. Manufacturer suggests application of graphic kit using the dry method.